← Grin And Bear It-How many is too many? Once you understand the moose rut, you will have a much better chance of finding moose. 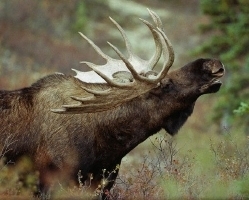 During the moose-rutting season moose are found in different areas than other parts of the seasons. What Season Is the Rut? Typically the peak of the rutting season for moose is the first two weeks of October. This is only an average though. The further north in the hemisphere you travel the earlier in the season the rut happens and the opposite is true for going south. There are of course always exceptions to the rule, but for the most part early October will be the peak. Some have hunted in early September and been able to call bull moose in using and estrous cow moose calls in an area that I know the peak rut is October. There will always be some cow moose that will start ovulating early and of course a bull moose that hears the yearning calls of a cow moose in estrous will investigate, and may even vocalize his approach. Where do the Moose Go During the Rut? We have been asked many times where do the moose go during the rut? Hunters have been out pre-rut scouting and located the moose. Once the season has arrived they return to where they found the moose and cannot find any! Why? Before the bull moose go into rut, they are usually found in the higher elevation areas. They will seek out cooler and thicker areas of the forest, higher in elevation trying to escape insects and predators. Cow moose and their calves on the other hand will stay in the lowlands near water. The cows seek out water for two main reasons… food and safety. Calves are vulnerable, especially to wolves and bears. A cow with calf will use the water as an escape when threatened by predators. Sure the insects will be more bother but the safety of water will outweigh this. When the moose rut begins and likely for a few weeks before the beginning of the cow moose estrous the bulls will move down out of the higher elevations to seek out the cows. The bulls will stay in the lower and wetter areas within proximity of the cows with hope of getting the breeding done. As the rut winds down the bull moose will once again move back to the higher elevations. This migration makes for a sometimes elusive hunt. Scan the area and look for all sign and be prepared for one exhilarating experience! Join us next time for what to do when you spot your moose! !